Welcome to this fantastic book of 100 brand new sudoku X puzzles. If you're looking for a Christmas gift for a puzzle lover, look no further than this fantastic gift idea. Compiled especially for the festive season, this collection is a great way to further advance your sudoku solving skills and celebrate the time of year. 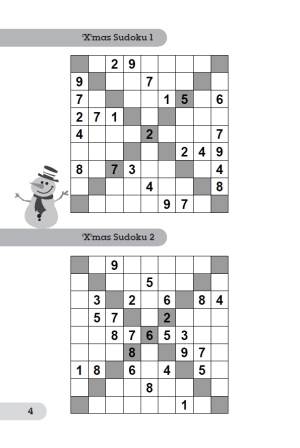 To solve sudoku X puzzles, you should proceed using the familiar rules from sudoku, but remember to apply the rules to the two grey diagonals also. 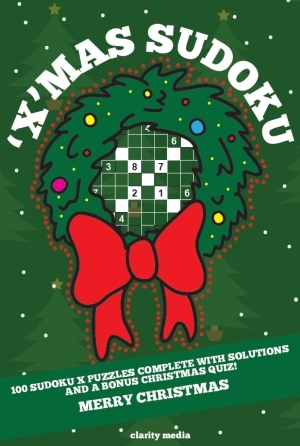 All puzzles feature solutions towards the back of the book and there's even a bonus Christmas quiz to enjoy. Good luck, happy solving & Merry Christmas! Please do let us know how you get on with this unique puzzle. Good luck and happy solving! New to sudoku? Be sure to follow the following tips and once you've mastered the basics, you will be a Sudoku 'X' pro in no time!